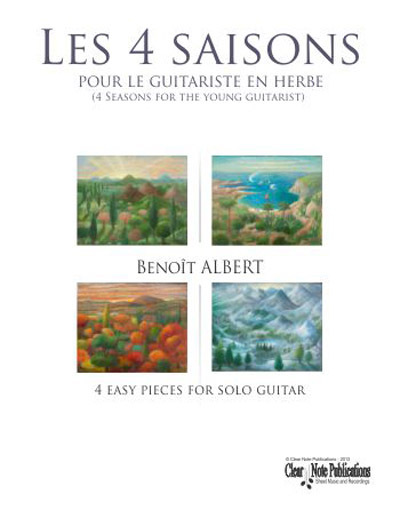 Written in 2004 for a French publication, the "4 Seasons for the young guitarist" are easy pieces for beginners (2/4 years of guitar). This second edition for Clear Note gives me the opportunity to refine dynamics and tempos. It's very interesting how melodies and themes can be around you during years as if they had some more secrets to tell you ! Six years after, In 2010, I wrote an orchestration of theses seasons for guitar ensemble and violin or flute (Commission from the Lens Conservatory - France) and as I speak I'm still working on violin and guitar duets based on the same material. I'm also very happy to present on the book cover the "The four seasons" from the English painter Rose Warnock.